The Galapagos Islands are a South American wildlife wonder, abundant with thriving flora and fauna. The archipelago of 19 islands in Ecuador is home to a fantastic range of sights and activities, with each island boasting its own unique and special features. Read on and discover below the top 5 reasons why the Galapagos Islands should undoubtedly be your next holiday destination! Weave your way through the archipelago and soak in the incredible marine views while relaxing on board a cruise ship. 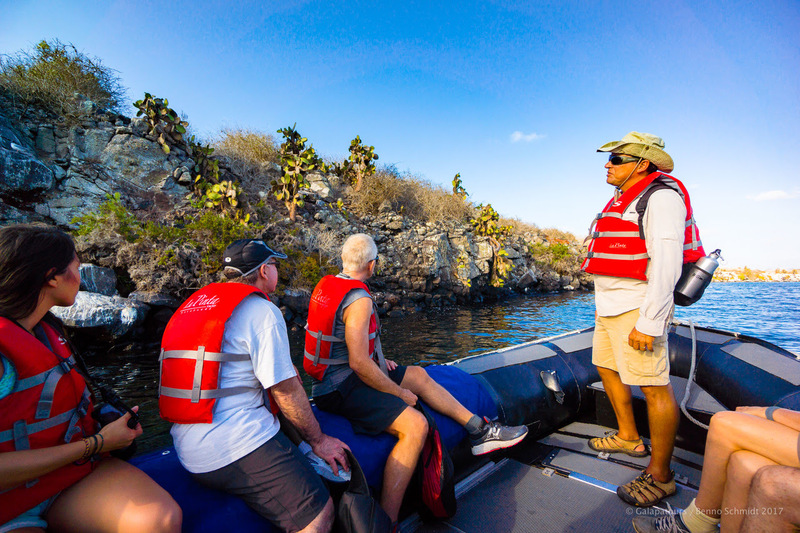 The Galapagos Legend, one of the most popular cruises, features a 300 feet long luxury vessel, designed for adventure with the comfort of a boutique expedition. Recently refurbished to the highest quality standards, the Legend is filled with impressive facilities and amenities, from open lounges where you can watch the dolphins, to glass-bottomed dinghies allowing you to marvel at the wonders beneath the water’s surface. Some of the most beautiful islands with the highest number of endemic species in the archipelago are Isabela Island, Genovesa, Espanola and Floreana. All of these islands are quite far off the center, so reaching them within day tours from Puerto Ayora in Santa Cruz Island is virtually impossible. In other words, a cruise really is the best way to gain access to these isolated splendors. The Galapagos Islands are a hiker’s dream, with countless trails through a vast variety of natural environments. Venture through dense forests to picturesque beaches, or climb towards breathtaking vantage points at volcanic craters. From lava fields to blindingly white sands, there’s undoubtedly something for everyone. These Islands are so varied, you will never grow bored discovering each new and unique place. Remember that if you want to go off marked tourist tracks, you will need to get the consent of the Galapagos National park. The Galapagos Islands are a natural wonder, and they want to keep it that way, and some of the flora and fauna is very delicately balanced. This minimizes any potential environmental damage. Some of the best hikes are actually on Santa Cruz Island though it is the most populace. Here you can explore verdant Scalesia forests and find the wild tortoises, which are plentiful. On the Galapagos Islands, you can find the world’s largest living species of tortoise! The Galapagos Giant Tortoises have lifespans exceeding 100 years and have massive weights over 900 pounds. Watch them in their natural habitat and learn about their history, habits, and significance to the region. Another fascinating creature unique to these islands is the tiny Galapagos Penguin, which holds the title of being the only species of penguin in the northern hemisphere. They’re a treasured creature, and with less than 2000 remaining, it’s always exciting when you get to see one! The Galapagos are one of the world’s most unspoiled UNESCO World Heritage Sites. Some of the endemic animals that only exist in The Galapagos, include Marine Iguanas, the Flightless Cormorant, colorful land Iguanas, and the famous aforementioned Galapagos Tortoises. The Booby birds are some of the most popular birds on the Galapagos. Of these, the Blue-Footed Boobies are the big favorite. The Pink Land Iguana which lives only on the Wolf Volcano on Isabella Island was just discovered in 1986 (by the science community that is) and was only noticed to be its own genus in 2009. If you’re a passionate diver or someone who wants to give it a try for the first time, the Galapagos Islands is the perfect place to be. Join organized tours and experience a thrilling dive beneath the crystal clear water. Catch sights of hammerhead sharks in the distance, friendly sea lions who may brush by, marine iguanas scuttling across the ocean floor and enormous schools of vibrant fish. You’re guaranteed to be impressed. It’s not all about the sights and sounds while on the Galapagos Islands! It’s also a cultural and culinary paradise as you explore some of the inhabited islands such as Santa Cruz or San Cristobal. Try out the local favorites by tasting exotic Ecuadorian fruits and vegetables, and tempt your taste buds with street food made fresh to order. You also can’t go without trying the staple dish – ceviche – a fresh seafood dish that will make your mouth water. The dishes are simple, light and fresh, combining the elements of Ecuadorian highland dishes with meat, potatoes, and grains, along with coastal ingredients like yucca, fish, and seafood. In the Galapagos Islands breakfast typically includes fried dumplings with green plantains (bolones) or fresh fruit. The fruit juices can include fresh new ideas such as tree tomato, but also more well-known favorites such as guanabana and passion fruit. Remember, that many fruits and vegetables are imports from mainland Ecuador. Encebollado is a common element in most Galapagos Islands restaurants, and yucca, chilies, and onion are a staple. Want to try sea cucumber? Go on, be brave. Why not? You are in a unique environment that you traveled halfway across the world to visit, of course, you want to try something a little different. Whether you’re an avid explorer in search of Galapagos tours or a seeker of relaxing havens and peaceful experiences, the Galapagos Islands have it all. Move it from the top of your bucket list and make it happen: book your next adventure!